I know myself all too well, home baked goods are irresistible to me so I try not to make the real deal. I often bake with a natural sugar substitute like dates, agave or maple syrup and i've been known to sneak some veggies in there too. Such as in this recent post for Black Bean Brownies https://steemit.com/food/@hangryginger/healthy-brownie-recipe-vegan-and-gluten-free With these you could easily fool your entire family, secretly knowing that they are indulging in healthy fibre and protein. However, when it comes to christmas cookies you just have to go all in! 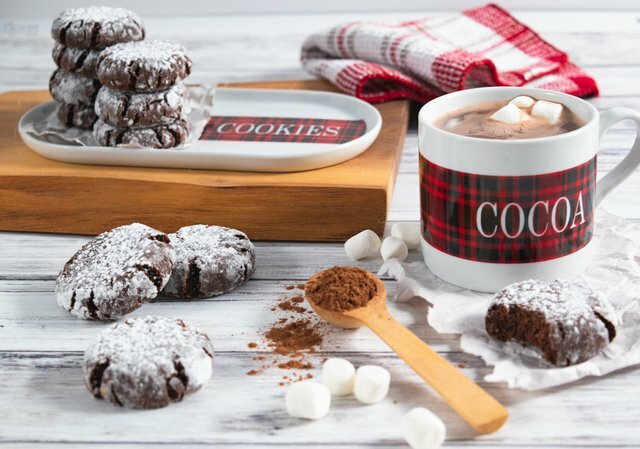 My sweet tooth was having a holiday party, enjoying these delicious vegan chocolate crinkle cookies! My husbands description of the taste was undoubtedly accurate saying they taste like a chocolate glazed donut :D These little cuties are dense yet soft and moist with a rich chocolate flavor. I would love to hear what your favorite Christmas cookie is in the comments below!